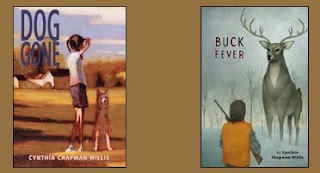 Cynthia Chapman Willis is the author of Dog Gone (Feiwel & Friends, 2008; Square Fish) and Buck Fever (Feiwel & Friends, November 2009). Visit her at www.cynthiawillis.com. Summer is a great time for reading. I love sitting outside, immersed in a wonderful novel or a nonfiction book (maybe a book on the craft of writing), with a glass of lemonade on a sunny day. I recently finished two books on writing that will end up on the top of my desk, where I keep my favorite books on craft (meaning within reach). Writing Fiction: A Guide to Narrative Craft, by Janet Burroway, Elizabeth Stuckey-French, and Ned Stuckey-French was recommended to me at a Highlights novel workshop. The Writer’s Journey: Mythic Structure for Writers, by Christopher Vogler was a gift from a well-published author who said this book changed his fictional writing life for the better. Writing Fiction: A Guide to Narrative Craft is considered a textbook, so be warned--it is a bit pricey. Still, I’m glad I bought it. The text outlines the writing process, including discussions on finding the right details, characterization, fictional time and place, story structure, point of view, and (of course) the process of revision. Short stories and writing exercises at the end of each chapter highlight and reinforce the lessons discussed. A sure sign of how helpful I find a book is how much I highlight the text and dog-ear the pages. My copy of Writing Fiction is tattooed in purple highlighter and sports many bent corners. It’s a good thing that I didn’t borrow my copy from the library. The Writer’s Journey: Mythic Structure for Writers explores the relationship between mythology and storytelling. This book focuses on screenwriting as well as novels. According to Christopher Vogler, "all stories consist of a few common structural elements found universally in myths, fairy tales, dreams, and movies." Agree or disagree, this book provides a lot of helpful and thought-provoking information for fiction writing, which probably explains why it is an international bestseller. The text discusses the story journey and its stages, which include archetype characters and the various points of the journey from beginning to end. Yes, I highlighted the text of The Writer’s Journey as much as I highlighted Writing Fiction: A Guide to Narrative Craft. I also dog-earred lots of pages. Have you read either or both of these books? Have you read any books on the craft of writing that you’d recommend? Anything that goes with sunshine and lemonade? I've not read these books but maybe I ought to now!! I do envy a book so good it's highlighted and dog-eared and then some! LOL! Good for you!! My Janet Burroway is dog-eared too! I have the Writer's Journey but haven't started it yet. Hope you enjoy the holiday! I hope you had a great holiday, too, Karen! I'm glad you've already discovered Janet Burroway's book! You are most welcome, MIchelle! Happy reading! I have Burroway's book, which I suspect is an earlier edition than the one in print now. Recent favorites of mine include STORY ENGINEERING, THE ART OF WAR FOR WRITERS, and THE WAR OF ART. Thank you, thank you for the recommendations, Marcia. I am always on the lookout for more good books on craft. Chris Vogler's book is amazing! I love it. And now, thanks to you, I am putting in an order for Writing Fiction. That one wasn't on my radar before, but it sounds great! Thank you! That sounds like a familiar title, Carol. I may have that one on my bookshelf, too. These two books look great, Cynthia, and I've not read either of them. Thanks for the recommendations. One of my favorite books on the craft of writing is Story Engineering, by Larry Brooks. Thanks, Victoria! I need to get my hands on a copy of Story Engineering. I have a few books like that - love when I can flip back and forth and get inspiration from those snippets I've highlighted! I haven't read those two. You weren't kidding about the prize. And of course it's probably much more expensive in Canada. An addiction. . . that's true for me, too, Stina! And yes, the price of Writing Fiction is (ahem) steep. Ugh. Thanks for sharing these books. I'll have to check them out. Forgot to mention, check out Bird by Bird by Anne Lamott. It will go beautifully with sunshine and lemonade. I love Bird by Bird. Thanks, Doralynn. Both of these sound like books I would enjoy. But the second, The Writer's Journey particularly seems to speak to me. Thanks for posting about them. You are most welcome, Bish! Happy reading! These both sound fantastic. Thanks for the recs, and enjoy reading in the sunshine! I don't have either, but I do have a well-used copy of Stein on Writing which I read years ago and which was excellent. I don't think I have that book, Lee. Thanks! I hadn't heard of either of these. Thanks for passing along your thoughts on them. I've just recently read John Truby's The Anatomy of Story. I highly recommend it! Great! Thanks for the recommendation, Ruth! That's exactly why I still prefer paper books for non-fiction--so I can highlight and dogear! These sound great! I still use Save The Cat and Hooked. I've never read either of these books. I'm with Christina. Save the Cat and Hooked are my 2 favorites. I probably need something more because I still don't have an agent. I haven't read either, but they sound extremely helpful. I'm busy with picture books this summer, but when I jump into another novel I want to use my writing workbook to help with it. Hope you are feeling great, Cynthia! What a wonderful way to spend a summer--with picture books! : ) Enjoy, Kelly! * And thank you for your thoughts--I'm well enough. I hope you are, too! These two books look great. I use Donald Maas. But my go to for editing is Chicago Manual and Merriam Webster digital. I'd like to read both, particularly the second one. The second one reminds me of The Hero with a Thousand Faces. It's not a craft book, but it goes over the common main character journey found in many myths, fairytales, and so on. I haven't read The Hero with a Thousand Faces. It's now on my list of books to read. Thanks, Medeia! The writing journey is one of my favorite writing books! It is amazing isn't it? Thanks, Nutschell! I've not read either of these. They sound useful. I will have to check them out. My biggest problem at the moment is managing the plot... Do these help with that? If someone gave me a plot-line I could quite happily write the novel around it, if I liked it enough. At the moment it's a real stumbling point. Managing plot can be a huge challenge for me, too. I thought both Writing Fiction and The Writer's Journey offered helpful advice for writer's focusing on plot. I'm the same way! I've been getting SO much more reading done this summer. It's wonderful. I have Writer's Journey, but should check out Writing Fiction. It looks good. It must be, if it's worth all those highlights, notes, and dog-ears! Coming around again to say hi and tell you I've left a little something for you on my blog. Hope you'll stop by and pick it up. Thank you!!! I am SO sorry that I am late responding, but very much appreciate this, Lee! I haven't read either of these books, but they both sound great. It's been awhile since I've cracked a book on writing, but I'm feeling the need for doing just that to freshen up the way i look at writing. Thanks for these two titles.